I’ve been working quite a lot lately with HTML and CSS and one of the things that I’m more than prepared to admit that I’m rubbish at is CSS-based layout. For those without a black-belt, CSS layout feels like a set of incantations that you have to get in exactly the right order for your content to appear even vaguely near where you hoped it might. For me, coming from a background of XAML based layouts, I’ve found this to be a challenge until I started to make use of the CSS grid layout. It’s worth saying up-front that this is available in IE 10 (see “can I use?”) which suits my current purpose but support isn’t widely available in other browsers. For the full definition of CSS grid there’s the W3C document and there’s also a very decent guide to it as a developer feature of IE 10 – because of the current standards status the grid bits are all vendor prefixed -ms- in IE 10 right now. 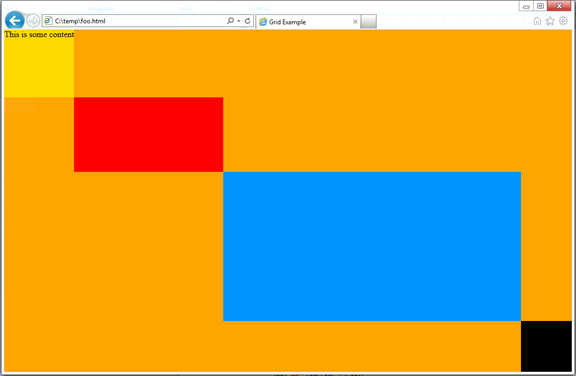 I think if you’re used to XAML based grids then you’re going to feel right at home. that gives me a big orange page that occupies 100% of the browser height (and width) without any scrollbar. The body element is now acting in "grid" mode. What's nice about all of this being defined in CSS is that the HTML content is left completely clean and devoid of anything related to layout. I’m not sure whether you could set the RowDefinitions and ColumnDefinitions of a XAML Grid via a style – I must admit that I don’t think I ever tried. which can be center, end, start and stretch which nicely gets around how this works in XAML where you had different enum values for vertical/horizontal alignment. 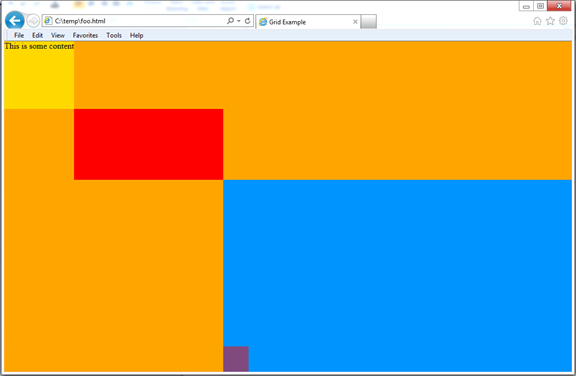 It's possible to have an element span more than one row or column via -ms-grid-column-span and -ms-grid-row-span and you can have more than one element in a single cell although it's more sophisicated than the XAML world because there's a specific -ms-grid-layer where -ve values are stacked to the back and +ve values to the front and 0 is the default. and so the black square in row,column (4,4) has disappeared behind the blue square which is spanning [3,3],[3,4],[4,3],[4,4] and has a layer of 0 so covers the black square which is at -1. There is a red square at 4,3 at layer +1 so it shows up but it has 50% opacity and so shows up as purple because of the red/blue mix. Generally – CSS Grid seems like a complete 100% win to me other than it’s obvious lack of availability right now. I’ve found that it makes standard layouts really easy and I’m making use of it everywhere that I can.